Plan to attend the Coast to Coast Connector (C2C) Summit on October 1, 2014 in Orlando. Learn about and map the future of the C2C, an approximately 250-mile corridor connecting 16 state, regional and local trails and 12 communities. 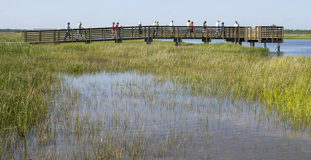 The C2C will also link residents and tourists to some of Central Florida’s most ecologically significant natural resource areas, including the Starkey Wilderness Park, Withlacoochee State Forest and Canaveral National Seashore. The 2014 Legislature allocated almost $16 million to help complete the trail. Trail users, planners, managers and elected officials will participate in the summit, sponsored by the Department of Environmental Protection’s Office of Greenways and Trails (OGT) and the Florida Greenways and Trails Foundation. Learn more by contacting the OGT at Brian.Ruscher@dep.state.fl.us or 850-245-2078. The 4th annual Florida Outdoor Recreation Summit is scheduled for Friday, September 12 at the Tallahassee Community College’s Wakulla Center in Crawfordville, Florida. Sponsored by the Florida Outdoor Recreation Coalition (FLORC), this year’s agenda will focus on outdoor recreation resources with discussions about trails, conservation lands, and the newly approved Florida Statewide Comprehensive Outdoor Recreation Program (SCORP). FLORC will assist the National Forests in Florida when they host the annual Florida National Scenic Trail (FNST) Symposium the next day at the same location. Visit Tallahassee learned that its innovative website, Trailahassee.com, earned honors and recognition by being listed among the “Best City & Urban Innovation Websites” at the 18th Annual Webby Awards. Hailed as the "Internet's highest honor" by The New York Times, the Webby Awards are presented by the International Academy of Digital Arts and Sciences (IADAS). The site also received two additional awards from the local chapter of the American Advertising Federation. Trailahassee.com provides a personal guide with map views and GPS functionality for more than 600 miles of hiking, biking, cycling, running and equestrian trails in the Tallahassee area. Visit Tallahassee created the site with assistance from the Tallahassee-Leon County Geographic Information Systems (GIS) department, which provides mapping technology for the City of Tallahassee, the Leon County Board of County Commissioners and the Leon County Property Appraiser’s Office. In related news, the National Association of Counties recently awarded Leon County a 2014 Achievement Award in the category of Parks and Recreation for their trail at Apalachee Regional Park. The trail gives runners the opportunity to run on several types of surfaces and is a premier cross country running facility. When not used for running events, the trail is used by the public for hiking, running and biking. 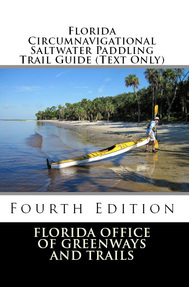 The fourth edition guidebook for the 1,515-mile Florida Circumnavigational Saltwater Paddling Trail (CT) is now available for retail purchase. All proceeds from the sale of the print-on-demand book go directly to the non-profit Florida Paddling Trails Association (FPTA). The FPTA serves as a volunteer steward of the trail as well as other paddling trails statewide. Retail copies of the $16.95 guidebook can only be purchased on Amazon.com. More than a dozen changes are included in the new edition, most of which relate to overnight stops. The 290-page guidebook, developed by OGT, alleviates the need to download and print 26 different segment guides and other information from the OGT website. It includes the trail guide text and data book along with trip planning and safety information and recommended gear for a CT journey. “The CT and other Florida paddling trails provide outstanding recreational opportunities for residents and visitors and help boost local economies,” said Florida State Parks Director, Donald Forgione. The Florida Greenways and Trails Council had a busy July meeting. They heard presentations on seven proposed acquisition projects and voted to recommend that six move forward. The council’s recommendations will be presented to DEP Secretary Vinyard. Upon his approval of the projects, the final list will be presented to the Division of State Lands to begin the acquisition process. The Council also approved the designation of several projects into the Florida Greenways and Trails System. The new designations include the Steinhatchee River Paddling Trail, State Road 207/Mussalem Trailhead along the Palatka-to-St. Augustine State Trail, a private island campsite in the Chipola River, the East Central Rail Trail, and 16 state parks. State designation increases visibility for a site or trail and can improve chances of receiving certain grants. Private landowners can receive liability protection if there is no charge for use of their property. The Council also welcomed three new members: Sam Carr of Palatka, Gil Hidalgo of Winter Park and Peggy Mathews of Tallahassee. All were appointed by Governor Rick Scott. The governor also reappointed Roberto Diaz de Villegas of Tallahassee and Speaker of the House Will Weatherford reappointed Ralph Lair of Zephyrhills to the Council. 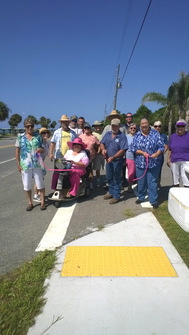 Sponsored by the Carrabelle Lighthouse Association, partners joined to celebrate the Grand Opening and Ribbon Cutting of Phase I of the Carrabelle Beach Multi-Modal Transportation Path on July 23, 2014. The half mile paved path connects the Crooked River Lighthouse and the Carrabelle Beach RV Resort, which is located across from the Franklin County Carrabelle Beach Park on Highway 98. In late 1943, Carrabelle Beach and Dog Island, while they were a part of Camp Gordon Johnston, were used by the U.S. Army 4th Infantry Division to train for the D-Day Invasion of Normandy in World War II. The trail vision started to become a reality in July 2008 when the Franklin County Commission, supported by many residents, businesses and local government resolutions, submitted a grant application to the Florida Department of Transportation for the project. By linking two major destinations, Franklin County envisions increasing visitation to the Crooked River Lighthouse, without increasing vehicular traffic, and providing exercise opportunities for a healthier community. Design for Phase 2 is nearly complete but funding for construction has not been secured. The multi-modal path closes a gap in the Florida Greenways and Trails System’s Land Trail Priority Network. Located nearby, Franklin County’s 6.3-mile St. George Island Bike Path passes the Cape St. George Light and connects to the Dr. Julian G. Bruce St. George Island State Park. The trails, lighthouses and parks are resources along the Big Bend Scenic Byway. Four Florida bicycling leaders will launch a rail-to-trail tour August 1-8 that will open a new era of Florida vacationing. They will ride SunRail from Orlando to DeBary Station and then bike for a week along the 260-mile St. Johns River-to-Sea Loop that runs through Volusia, Brevard, Flagler, St. Johns and Putnam counties. The route is a segment of the 2,900-mile East Coast Greenway being built between Florida and Maine. A send-off event for the cyclists will take place August 1 between 7:30 and 8:00 a.m. at DeBary Station. The tour -- First Florida Rail-to-Trail Tour, 2014 -- will be GPS-ed so that cue sheets and maps can be developed for future cyclists. A website is also underway and will be announced when complete. The four cyclists are former Florida Bicycle Association (FBA) Chair Mighk Wilson, former executive directors Carol Wilson and Laura Hallam, and cinematographer Robert Seidler. 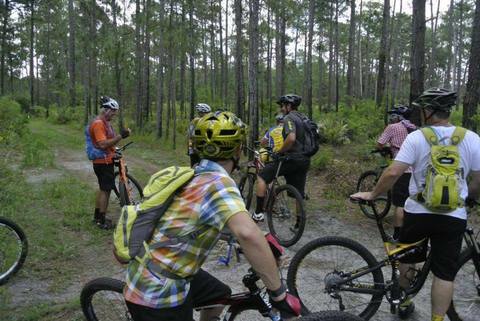 Visitors to the Pasco County Parks and Recreation Department’s Jay B. Starkey Wilderness Park can now experience a new off-road bike trail, designed to showcase some of the park’s natural beauty. A dedication ceremony was held June 2 to celebrate the new trail. Late last year, the South West Association of Mountain Bike Peddlers (SWAMP) gained approval to create the new off road bicycle trail. Volunteers used hand tools and pieces of heavy machinery to groom the trail. Every effort was made to utilize shady areas, which riders appreciate. The first seven mile section, dubbed the “Magnolia Trail”, is an access trail to the heart of what is anticipated to be a 35-mile trail system in the 8,000-acre park. The Magnolia Trail leaves from Parking Lot #10 and winds through pine uplands, old growth oaks, scrub oak, flatwoods, past wetlands, cypress domes and a beautiful lily pond. "This trail is designed to showcase some of the park's most beautiful parts by going near or through them,” said Rudy Miller, SWAMP Club volunteer. “There is ample twisting and turning to give the riders rhythm and a challenge." For additional information, please visit the SWAMP club website. On May 8, Palm Beach County celebrated the grand opening of public-use facilities at its Pine Glades Natural Area. 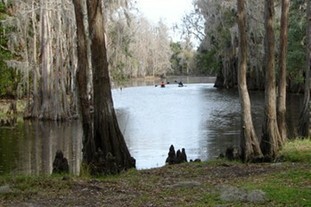 In 2011, the 6,642-acre natural area was designated as part of the Florida Greenways & Trails System. Facilities constructed on the site include seven miles of hiking and nature trails, a wildlife observation platform, a canoe/kayak launch, a covered picnic area with educational kiosks, bicycle racks, a restroom and a fishing pier for catch-and-release. In addition, a half-mile portion of the “Old Wire Trail” was restored. The Old Wire Trail was a Seminole Indian War-era telegraph wire/trail that once connected Fort Brooke, near present-day Tampa, to Fort Jupiter, east of the natural area. Prior to its acquisition, the eastern 1,200 acres of the natural area had been heavily impacted by mining and agricultural activities and invasive non-native vegetation. This area was restored through the implementation of an extensive hydrological restoration project, the removal and treatment of invasive nonnative plants and the implementation of a prescribed fire program. The site is open to the public from sunrise to sunset. Construction of the first phase of the Shingle Creek Regional Trail (SCRT) within the City of Kissimmee and Osceola County will begin this fall. Construction begins just south of the US 192 / Shingle Creek bridge crossing and proceeds three-quarters-of-a-mile north to a new trail bridge over Shingle Creek. This trail connection over the creek will provide trail users access into the Babb Landing Park. This phase of the project will also connect with the historic Steffee Landing, Steffee Homestead and Osceola County’s new Welcome Center and History Museum, all of which are located along US 192 at the creek crossing. In related news, the City of Kissimmee and Osceola County joint selection committee has selected Kelly, Collins & Gentry, Inc. (KCG) to design the second and final phase of the SCRT (FDOT LAP Project – Sequence 2). The KCG Team ranked #1 in the selection process and will bring the same innovation and expertise to the next project phase as they did in the first phase. In all, the SCRT will span 32 miles across Central Florida beginning at the Kissimmee Lakefront Park and ending near Orlando – at the Headwaters of the Everglades. The Volusia County Council cut the ribbon for the newest segment of the Spring-to-Spring Trail on June 18. The new trail segment stretches almost one mile along DeBary Avenue from Mansion Boulevard to Deltona Boulevard. It connects two longer Spring-to-Spring Trail segments, providing 15 miles of contiguous trail from State Road 415 in Osteen to Lake Monroe Park in DeBary. 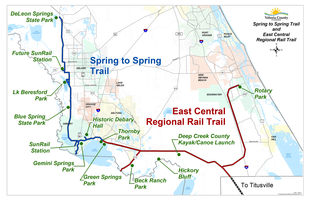 The Spring-to-Spring Trail connects with the East Central Regional Rail Trail at Green Springs Park in Deltona. The Spring-to-Spring Trail and East Central Regional Rail Trail are works in progress, with new segments reaching completion every year. The paved trails are being designed to accommodate people with all abilities, including walkers, joggers, inline skaters and bicyclists. The Spring-to-Spring Trail has reached the half-way point, with 13 miles of completed trail segments. When complete, it will stretch 26 miles from Green Springs Park in Enterprise to DeLeon Springs State Park. In July, workers started construction of a 2.6 mile segment of the East Central Regional Rail Trail in Osteen. The new segment extends from Guise Road to the State Road 415 overpass, which is also under construction. Acquired in 2007 with Florida Forever funds through the Greenways and Trails Acquisition program, the project represents the longest rail-to-trail conversion in Florida and will bring a myriad of recreational and economic benefits to Central Florida. The City of Titusville and Volusia and Brevard counties are developing and maintaining the trail through a sublease from the state. The 52 mile rail trail stretches from Deltona to Edgewater with a 10-mile leg through Brevard County to Titusville. The Volusia County section of the rail trail is expected to be complete in 2020.Click here to learn more about Volusia County’s Parks, Recreation and Culture program. Click here to learn more about Volusia County’s Parks, Recreation and Culture program. 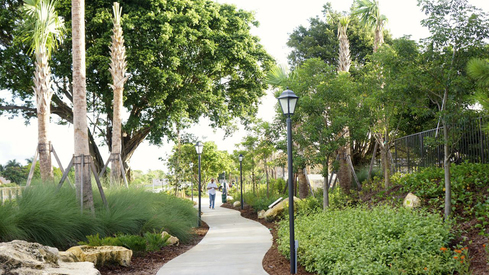 Old Dixie Eco Walk in Boynton Beach, Florida is the first reforestation of a city easement. This quarter-of-a-mile long public eco-art project connects a wildlife habitat to neighboring Seacrest Scrub Natural Area and the city’s future Blueways, Greenways, Trailways project. Creators, eco-artist Lucy Keshavarz and landscape professional David Bodker, consulted scientists and butterfly professionals, to combine over 60 species of native plants, that attract and sustain butterflies. Sculptural resting areas, butterfly watering holes, plant identification plaques and informational panels actively encourage the public to learn about the benefits of this wildlife habitat. The project promotes the green features of Seabourn Cove, the nation’s first and largest sustainable gated community, making the invisible visible. It illustrates how enjoyable and necessary sustainable design is for all species. Old Dixie EcoWalk is an active resource for organizations such as the North America Butterfly Association (NABA) and the Florida Native Plant Society. Old Dixie Eco Walk is part of the Seabourn Cove community located at 3501 South Federal Hwy., Boynton Beach and can be accessed on the east side of Old Dixie Hwy north of Gulfstream Road. The Cabot Community Tour (Tour) was created to strengthen communities and honor volunteerism. On June 21, a grand finale celebration at Adventures New York in Central Park marked the culmination of a six-week, 900+ mile biking journey that began May 17, in Jacksonville, and closely followed the East Coast Greenway (ECG) through small towns and big cities along the east coast. Cabot Creamery Cooperative, the organizer and one of the sponsors, invited cyclists to participate in shorter ride events at designated towns along the route. To start the Tour, the North Florida Bicycle Club organized the ride which included the completed section of the S-Line Urban Greenway. The S-Line was partially funded through the Recreational Trails Program and is part of Rails-to-Trails Conservancy’s Urban Pathways Initiative. Participants continued along gaps and existing trails within the Florida Greenways and Trails System Plan’s Land Trail Priority Network. 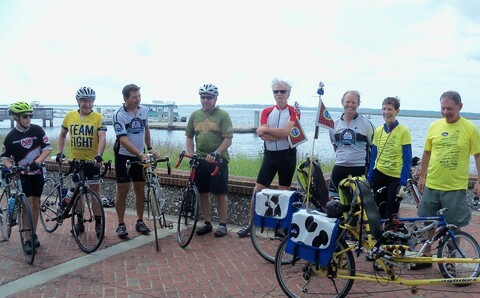 As participants disembarked from the St. Johns River Ferry on the second day of the Tour they were greeted by the Friends of Amelia Island Trails. The Ferry is a vital link for the ECG. Cabot’s first Community Tour along the ECG took place in 2012 and ran from Miami, Florida to Portland, Maine.